While plenty of people condemned Bob Dylan to Hell for going electric in 1965, a separate faction praised and enjoyed the new sonic territory Dylan explored. At the time, Bryan Ferry was among the latter ilk. Admittedly, Ferry didn’t even like Dylan’s early folk albums. Since then, though, he changed his way of thinking and grew to appreciate the full spectrum of Dylan’s gift as a songwriter. On Dylanesque Live: The London Sessions, Bryan Ferry offers such insight as to his reverence for Bob Dylan’s music in addition to studio performances of each of the eleven tracks on his recently released album of Dylan covers, Dylanesque. A performance of “Don’t Think Twice, It’s All Right,” a song not on the album, along with Ferry’s 1973 promotional video for “A Hard Rain’s A-Gonna Fall,” rounds out the disc. While the performances comprise the bulk of the content on this DVD, it’s Ferry’s commentary between the tracks that is most interesting. For instance, Ferry concedes that he based his interpretation of “All Along The Watchtower” on Jimi Hendrix’s iconic version of the song, not Dylan’s original. Incidentally, Dylan himself plays the Hendrix arrangement in concert to this day. Of the performances, Ferry delivers his finest effort with “Gates Of Eden”. With its cavernous feel and the vocalist’s weary inflections, the song sounds like a march toward the end of the world. Ultimately, though, this DVD should interest people for the commentary, not necessarily the performances. While the tracks sound fine, watching one song played after another in a studio, without an audience to provide reaction or an environment of a concert, becomes tedious. It’s simply easier to listen to the songs on CD. 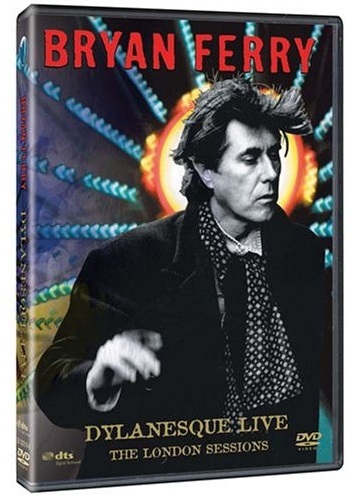 The most rewarding aspects of Dylanesque Live: The London Sessions are the instances when Bryan Ferry explains how he approached interpreting each of the songs on Dylanesque. Those instances, more than anything, comprise the overall purpose of this DVD: To illustrate how a unique vocal talent handles the work of a songwriting giant.